We all want to find good quality replica watches that look and function just like the original ones, but cost only a fraction of its price. Let me tell you that this is a difficult mission, a real walkabout through the outback of online replica companies. Today we stop to shed some light on AllBuyWatches.co.uk and discover the horological wonders it has to offer. 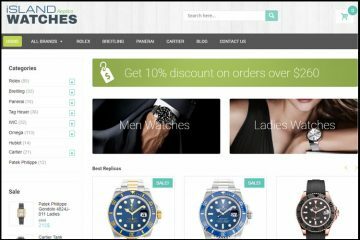 AllBuyWatches.co.uk is a simple looking website, a website that doesn’t inspire any professionalism. 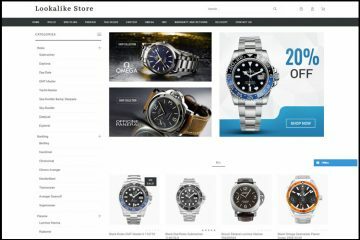 The layout looks so simple and amateur that it would have been more adequate for a blog rather than for a replica online store. Nevertheless, the appearance is pleasant and it kind of grows on you with its white and grayish color scheme. As expected, browsing through the website is quite easy and it doesn’t raise any complications for its visitors. The products can be accessed either from the top menu bar or from the left side one. Both show the available brands, only that the left side list is more inclusive. Still, the collection doesn’t mention too many watch names. The company provides only 8 brands. That’s not much, but it is more than enough for those who know how to appreciate the value of a timeless design, because indeed here you will come across the world’s most known timepieces. Each category is carefully divided into sub-collections and this makes it really easy for us to browse the items even if there isn’t a filter available. The prices are in GBP and at a first glance these replicas are quite affordable. The watches are divided into two categories: replicas with Swiss ETA movement and replicas with Asia Automatic Movement (21 Jewel). The first category includes watches priced at 250-350 GBP while the second one has a lower price range, 70-90 GBP. Each product has a well-made description page meant to reinforce the selling price. The description mentions every important technical detail of the watches, such as movement, materials, functionality and size. If you have received an order from AllBuyWatches.co.uk and you are not satisfied then you must know that you can return the items within the first 15 days. First, contact the company and inform them of the reasons why you wish to return the merchandise. They will then provide you with the return details. The refund will be issued 2 weeks after the order is received at the company’s warehouse. Please note that, the costs involved with returning the items are the customer’s responsibility. Also, a 15% handling fee and a 20 GBP shipping fee will be deducted from the refund amount. The accepted payment options are Visa and Mastercard, or at least this is what the company claims on the FAQ page. Only after checking out of the Shopping Cart you discover that there is just one available payment method and this is: Visa card. Mastercard payments are not supported. Websites that are not true to their customers from the start risk losing many of its visitors. Better say the whole truth from the beginning and avoid looking like a liar in front of your customers. Even though on the Shipping page it says that delivery if free worldwide, this is also not true. After checking out and selecting the delivery country, the website adds a shipping charge to your order. For example, for USA it is 19 GBP. The delivery time is estimated to 7-10 business days and all packages are shipped with a tracking number. Also, the order processing time is 1-2 days and packages can be shipped only at the billing address registered on your card. Pictures: AllBuyWatches.co.uk has many pictures for its replica watches. All images are very nice, well made, and, most important, clear and show all important parts and details of the products. The really huge shame is that the photos have the watermark of a different replica website: WatchJust.com. 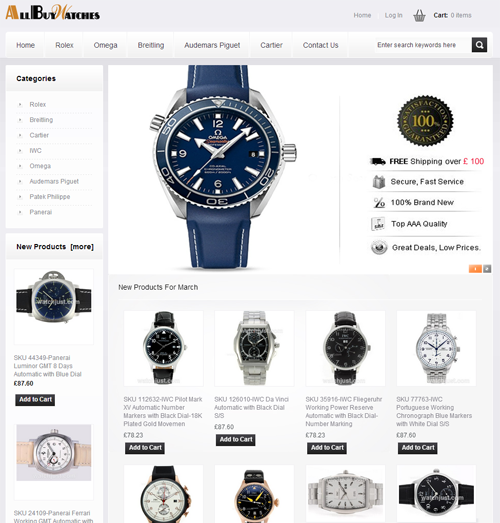 This is an inexistent page and it is very likely that it is the former domain name of AllBuyWatches.co.uk. Still, it looks highly unprofessional and makes us question how serious and stable this replica company really is. Customer Service: The customer service can be contacted only by email or by Contact Form. There is no contact phone number available or a live chat service. Furthermore, the contact email address is a Hotmail account that seems very Chinese [email protected] This doesn’t inspire any trust or confidence both in the services it provides and in the security of the information sent by this way. I would seriously recommend to the company that it reconsiders and improves its customer services. 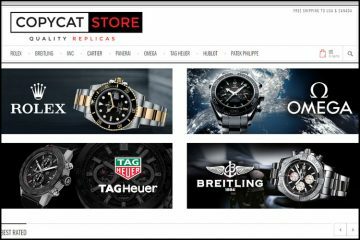 Summary: AllBuyWatches.co.uk is an online replica company that allures us with low prices, a considerable and divers number of fake watches and with a versatile return and exchange policy. Still, it has many minuses, minuses that simply cannot be ignored by a truly wise online shopper. The professionalism and responsiveness of its customer services are questionable, its product pictures are from an uncertain source, and its payment and shipping policies are deceitful. 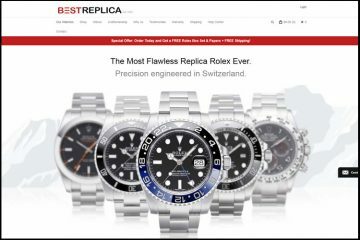 I honestly wouldn’t feel safe ordering from this replica website and this is also the reason why I cannot recommend it as a trusted source of good quality replica watches. as outlined in this sites review, they need to tweek a few of their processes and provide ‘accurate’ product information. Copyright © 2018 Replicareview.co. All Rights Reserved.